Topics: Services, and Get An Estimate. Its 5 DNS Records include, dns01.gpn.register.com, dns02.gpn.register.com, and dns03.gpn.register.com. It is hosted by Icon Developments (Utah, Lindon,) using Netscape-Enterprise/4 web server. 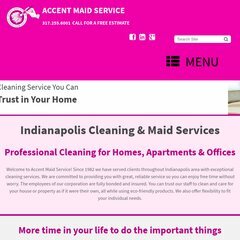 Accentmaidservice.com's IP address is 192.41.9.14. A ping to the server is timed at 53.2 ms.